I advise graduate students that work in the intersection between Anthropology and Development Studies. I am particularly interested in students whose work is on political borders, resource frontiers, land rights, sovereignty, and state formation. My primary regional expertise is in Southeast Asia, however, I am willing to take on students with similar thematic interests irrespective of their regional focus. Please send me an informal email describing your potential research interests if you are considering applying to our PhD programme. Associate Professor, Aarhus University (Oct 2014-present). Assistant Professor, Aarhus University (July 2010-Oct 2014). From October 2011 to March 2012 I was a Visiting Professor at Department of Anthropology, University of Toronto associated with the research cluster "Producing Wealth and Poverty in Indonesia's New Rural Economies" headed by Professor Tania Murray Li. From February to April 2013 I was a Visiting Scholar at Department of Environmental Science, Policy, and Management, UC Berkeley associated with the "ESPM Land Lab" headed by Professor Nancy Peluso. From May-June 2018 and September-December 2019 I was a Visiting Professor at Department of Food and Resource Economics, University of Copenhagen associated with the Rule and Rupture Programme headed by Professor Christian Lund. Co-Edited with Jason Cons. Published by the Antipode Book Series, Wiley-Blackwell 2019. Frontier Assemblages offers a new framework for thinking about resource frontiers in the contemporary moment. Over the past several decades, there have been radical transformations in marginal spaces throughout Asia. Millions of acres of land have been rapidly converted to sites of large-scale monoculture production, mining, and other forms of resource extraction. At the same time, alternative marginal spaces are also being reframed as new kinds of productive sites—zones slated for massive infrastructural projects, spaces of capital extraction through privatized health care, habitats of ecological reclamation and sustainability, speculative locations for carbon storage, and areas where environmental degradation is itself a source of productive power. How might we understand the conjunctural forces which continue to precipitate these sweeping transformations throughout the region? And what do these shifts portend for these margins, many of which have and continue to be sites of intense securitization, instability conflict, and expansion? This book proposes that we think these territorial transformations together, as resource frontiers in the making. Moving away from an exclusive focus on political economies of extraction, we understand these spaces as also sites of creative, if often ruinous, production. To that end, we engage in a collective process of tracing the frontier assemblages that are intimately bound up in these territorial transformations. See Chapter Abstracts here. 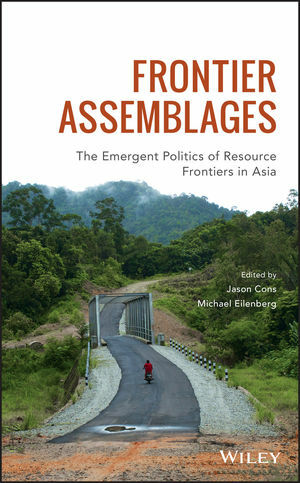 Cons and Eilenberg’s Frontier Assemblages is a collection of richly textured essays tracing the incorporation of remote areas into new territorial formations in the context of Asia. Framed through the notion of assemblage, the collection speaks to the complexity, lability, and nonlinearity of these transformative processes. It will be essential reading for border scholars and specialists of Asia alike. — Franck Billé, University of California, Berkeley. This fascinating collection sheds new light on the varied dynamics of frontier-making across a diverse and sometimes surprising set of spaces in Asia. It is especially strong on frontier temporalities of anticipation and ruin, and on the productive (not just extractive) work of resource frontiers. Frontier Assemblages is highly stimulating, analytically rich, and not to be missed. — Derek Hall, Wilfrid Laurier University. Co-Edited with Christian Lund. Published by Wiley-Blackwell in 2017. Rule and Rupture examines the ways in which political authority is defined and created by the rights of community membership and access to resources. It combines the latest theory on property rights and citizenship with extensive fieldwork to provide a more complex, nuanced assessment of political states commonly viewed as “weak,” “fragile,” and “failed”. Contains ten case studies taken from post-colonial settings around the world, including Cambodia, Nepal, Indonesia, Afghanistan, Rwanda, Somalia, Democratic Republic of Congo, Colombia, and Bolivia. Rule and Rupture begins with a striking and original point of departure: the realization that the disposition of property and of the rights of membership in the political community are what constitute public authority. The volume fully realizes its promise in the subtle analysis of both failure and success in case studies. Henceforth I will insist that students read Lund and Eilenberg’s path-breaking book on state-formation in conjunction with the classical text of Max Weber. - James C. Scott, Sterling Professor of Political Science, Yale University. 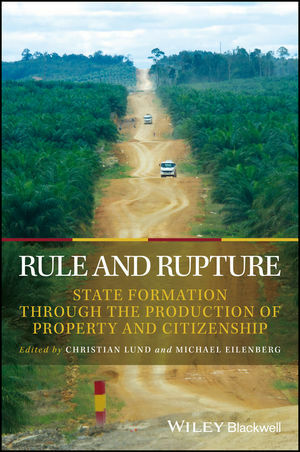 Rule and Rupture provides a fresh and powerful empirical analytic of State formation. By focusing on the dialects of recognition that create both authorities and rights holders, the volume shows us how society is constituted through multiple social contracts. The book offers a truly new and exciting approach to the material study of society and social change. - Jesse Ribot, Professor of Geography, University of Illinois. Set in West Kalimantan, Indonesian borneo, this study explores the shifting relationship between border communities and the state along the political border with East Malaysia. The book rests on the premise that remote border regions offer an exciting study arena that can tell us important things about how marginal citizens relate to their nation-state. The basic assumption is that central state authority in the Indonesian borderlands has never been absolute, but waxes and wanes, and state rules and laws are always up for local interpretation and negotiation. In its as key symbol of state sovereignty, the borderland has become a place were central state authorities are often most eager to govern and exercise power. But as illustrated, the borderland is also a place were state authority is most likely to be challenged, questioned and manipulated as border communities often have multiple loyalties that transcend state border and contradict imaginations of the state as guardians of national sovereignty and citizenship. Journal of Asian Studies: Eilenberg's compelling analysis demonstrates the value of borderlands as productive sites to explore the complexities of state power. Importantly, he points out that many studies of borderlands overemphasize local populations' resistance to the state. By contrast, the book makes a significant contribution to the literature on state-society relations by illustrating how local elites engage in “networks of collusion” with state authorities to best serve their interests (p. 55). In addition, Eilenberg draws attention to how political decentralization can blur the line between legality and illegality, because local authorities often have a different understanding of wrongdoing than that established by state laws. These discussions will make At the Edges of States helpful to scholars interested in state-society relations and political decentralization in Indonesia and beyond - Jennifer Estes, University of Wisconsin-Madison. Journal of Asian Studies. IIAS Newsletter: Eilenberg’s conclusion offers what may be the greatest theoretical contributions noting that within the study of the borderlands, the notions of illegality and legality are often seen as too rigid. When in fact, as demonstrated by certain cases amongst the Iban community, the notion of what is not only acceptably ‘legal’ but also the ‘laws’ that should be followed, can diff er substantially from pre-existing state oriented conceptions. Thus, Eilenberg closes with a provocative call to re-examine the blurred notions between what is ‘legal’ and ‘illegal’ practice amongst the Iban borderlands of Kalimantan and Sarawak that stretch along the Indo-Malay state border on the island of Borneo - William B. Noseworthy, University of Wisconsin-Madison. The aim of my current research is twofold: First to provide a local perspective on the rapid changing social and political environment in the borderland of West Kalimantan, Indonesia, and second, to create and understanding of the often paradoxical and conflicting relationship between border people and their states. Research on the political, economical, and social processes along international borders have primarily taken a top down approach, mostly focusing on state level activities, and how nation-states deal with their borders and border people. Much less attention has been given to the local agency of borderland communities, and how these communities are continually engaged in negotiating the political and cultural significance and status of borders, through different transnational cross-border practices and relations. My research rests on the premises that borders such as that between Indonesia and Malaysia offer an exciting study arena that can tell us important things about how marginal citizens relate to their nation-state and in particular how alliances, with their competing and multiple loyalties, are managed on a daily basis. Recent processes of decentralization have dramatically changed local political configurations in Indonesia. In particular, the remote regions at the edges of the state have, in the name of regional autonomy, experienced new spaces for maneuver. By stressing the unfolding relationship between border communities and the state I examine how local-level politics has taken its special configuration in the remote border region of West Kalimantan, Indonesia. The RISEZAsia project (2016-2019) studies the emergence of new Special Economic Zones (SEZ) that promotes the development of remote and resource rich borderlands across Asia. Theoretically the project wishes to develop tools for critical engagement with the unique forms of exclusion and marginalization in borderlands instigated by SEZs. Secondly, in addition to its contribution to theoretical framings of borderland political economy, the research is significant for documenting the processes through which Asian borderlands currently are experiencing some of the largest land-grabs in modern history. Through the creation of new SEZs, million of hectares of land are being annexed to mining and plantation companies for industrial exploitation and remote borderlands are being colonized by thousands of labor migrants. These large-scale acquisitions of land and the infrastructure projects it has enabled have large impact on these ecologically vulnerable border zones and its population. The project is funded by a Starting Grant from Aarhus University Research Foundation. The SCIFOR project (2014-2017) is a partnership between four institutions in Denmark, Tanzania and Nepal. In Denmark, the Department of Food and Resource Economics (IFRO), University of Copenhagen comprises one of the largest research environments on natural resources management and livelihoods in Europe, and this is bolstered with additional expertise on institutional ethnographic approaches by the partnership with the Department of Culture and Society, Aarhus University. The project is funded by Danida and led by associate professor Jens Friis Lund, and will study the so-called scientific forestry plans in Tanzania and Nepal and their role in granting – or not granting – rural people forest management rights. The aim of the project is to develop and promote participatory forestry approaches that, in practice, support equitable, environmentally sound, and economically rational forest management. Read more about SCIFOR: Science and Power in Participatory Forestry. This project (2011-2014) studies the drive behind rapid agrarian expansion in frontier regions of developing states in Southeast Asia (video link). Specifically, it seeks to develop an integrated understanding of how the current expansion of state-sponsored plantation development along the Indonesian-Malaysian frontier is interlinked with national policy regimes of national development, issues of territorial sovereignty, and global market demands. The project is funded by a Sapere Aude - Young Elite Researcher Grant from the Danish Council for Independent Research - Social Sciences. Deforestation and degradation of forests in the tropics is depicted as a major source of emissions of CO2. It is estimated that between 12 and 20 percent of total world emissions of CO2 come from deforestation. REDD (Reducing Emissions from Deforestation and Forest Degradation) is seen as one of the tools that can help to ensure more effective forest conservation and reduce the proportion of CO2 emissions. The REDD program was launched in 2009 by the UN and is part of the Copenhagen Accord (COP-15). REDD funds is proposed to create economic incentives for developing countries to maintain and strengthen the management of their forests and thus help lower global emissions of CO2. Under this initiative, developing countries can refrain from deforestation and be credited for the amounts of CO2 that are left untouched. These credits can then be sold to industrialized countries that need to reduce emissions to meet their own targets. This project (2012-2014) examines the paradoxical outcomes of the global and local negotiations over the value of forests and investigates the mechanisms behind the implementation of REDD as a specific value scheme in West Kalimantan, Indonesia. A main assumption is that when REDD initiatives and discourses of carbon trade are attempted implemented on the ground these global discourses will combine with local terms and practices producing unexpected effects or ‘friction’. Critics argue that REDD policies can be manipulated and threaten to generate land grabs, displacement, conflicts, corruption and impoverishment. REDD seems riddled with conflicts of interest. These can make the initiative very difficult to regulate without a combined understanding of the various interests at stake, and the relationships of power in which they are embedded. This project is funded by the the Aarhus University Research Foundation. This research unit, directed by Professor Christian Lund, University of Copenhagen, investigates the process of state formation and fragmentation in developing societies. We study this apparently incongruous process through a focus on local politics and the social production of property and citizenship. Conventional state theories, modeled after developed societies, see state institutions as a source of hegemony. We investigate how hegemonic struggles over the power to determine the parameters of property and citizenship create moments of sovereignty and form different institutions with state quality. It is in the creation of the political delineations of two fundamental aspects of social life: what we can have, and who we are - property and citizenship - that state quality is produced. The focus is the political, social and developmental consequences where states have limited empirical sovereignty and where states have been forced to cede ground to competing non-state forms of authority. We undertake field research in rural, peri-urban and urban contexts in Benin, Ghana, Indonesia, Laos, the Philippines and Zimbabwe.